Material: Brushed Nickel. For use with THR Handrail. It is easy to install a new banister with the handrail bracket from the SOLUTION range. 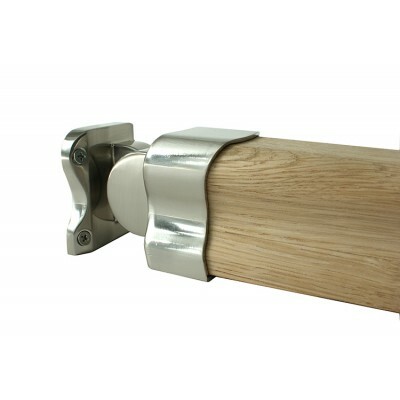 This quality brushed nickel bracket enables speedy connection of stair handrails and landing handrails to Newel Posts. No need for complicated joints and cuts with this Handrail connector that simplifies and speeds up the installation of your banister handrail. Simply secure to one end of your handrail with the included screws, then position against the newel post, mark, drill and fix. The handrail connector can be used on both landings and stairs. Suitable for stairs with a maximum rake of 50 degrees. For use on landings and at the top and bottom of stairs. Fixings included. Suits our 58mm (w) x 58mm (h) standard profile handrails (THR). Fixing Holes: 7 x 4mm dia.